The Horizon Interactive Awards, now in its 15th season, has become one of the most prestigious awards in the field of interactive and creative media. The competition recognizes, promotes and awards the best web sites / web site design, interactive, videos, online advertising, print media and mobile applications. Each year, the Horizon Interactive Awards receives thousands of entries from all over the world and a volunteer panel of industry professionals, from diverse multi-media, graphic design, advertising and marketing backgrounds, review the entries to determine the work that is to be recognized. 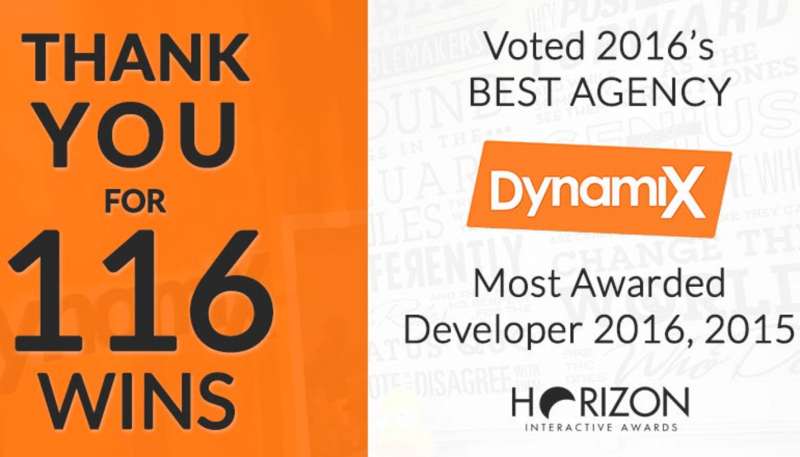 DynamiX is thrilled to announce that we have been again recognized as the Most Awarded Website Developer for the second year in a row, taking home 116 trophies for our clients including 1 Best in Category, 37 Gold, 53 Silver, and 25 Bronze. Moreover, our team has been recognized with the highly coveted ‘Best Agency‘ award, based on the scope and breadth of award-winning work DynamiX developed for 2016. A huge thank you to the Horizon Interactive Awards, and especially to our amazing clients who trust us to create transformative experiences on their behalf. We love you!